One of best educational experiences I ever had was a class called “Yeats and Eliot” that I took as a college sophomore. I’ve been reading and rereading his work ever since. 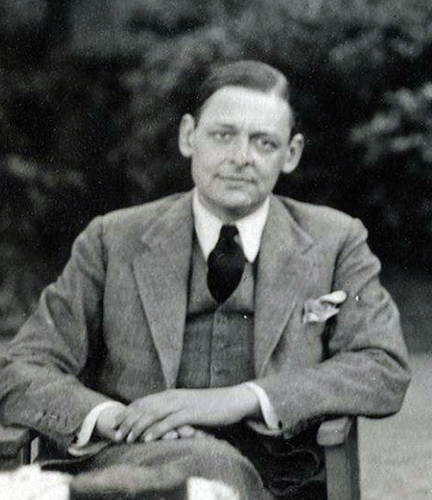 The name of this blog, “The first gate(s)” comes from the opening of Eliot’s long poem, “The Four Quartets,” which matches the scope and depth of the work of any poet who ventures into ineffable realms. “How unpleasant to meet Mr. Eliot! By all accounts, he was also a joker, who served whoopee cushions and exploding cigars to dinner guests. He and Groucho Marx were mutual fans. Marina was #29 in Eliot’s series of “Ariel Poems,” first published in September, 1930. It was based on the Jacobean play, Pericles, Prince of Tyre. Shakespeare is credited with the last acts of the play, the story of Pericles’ separation from, and reunion with, his daughter, Marina (most scholars believe the opening was composed by an inferior collaborator). The play however, was simply a catalyst for poem that lives a life of its own, with haunting imagery that I think can speak to any of us, wherever we are. Under sleep, where all the waters meet. Bowsprit cracked with ice and paint cracked with heat. Between one June and another September. Made this unknowing, half conscious, unknown, my own. The garboard strake leaks, the seams need caulking. The awakened, lips parted, the hope, the new ships. This entry was posted in Authors, Poetry and tagged authors, poetry, T.S. Eliot. Bookmark the permalink. I’ve tried and tried to relate to Eliot, but never found that connection. My husband loves his work. I wonder if men simply relate better to his work. Although my relationship with his work could be colored by the fact that the worst professor I ever encountered in my life was a huge fan. I’m sure some poetry has more fans in one gender than the other. The blind dislike for Emily Dickinson that a British Council teacher I knew exhibited was half sexism. But there could be a million examples. Take “The Love Song of J. Alfred Prufrock.” It’s a very accessible poem for Eliot, but it has to appeal to men more than women because the insecurity it treats is much more a male experience. In “Marina,” when we think of the context in Shakespeare’s “Pericles,” some of Pericles’s private thoughts on mistaking his daughter for his young wife would be incestuous if pursued, I think. And that would be a male kind of illicit feeling, wouldn’t it? I have a female professor teaching me Eliot and she likes his poetry so much that I often wonder what it is that she can see in his poems that I can’t. It isn’t gender, but something else. I like Eliot but I don’t relate to him all the time. But ‘Prufrock’ poem is breathtakingly beautiful. You’re right, this stuff is beyond issues of gender. Have a look at the Four Quartets. Skip over the sometimes annoying obscurities. Look at it a little at a time and let it grow on you. I’m female and I love his work, always instantly react to it emotionally and physically, even if much of the understanding only comes years later! The closest thing I can think of or passages like that is Rumi, and yes, the meaning I take from it forever changes and deepens. Thanks for your comment! or another way of saying the same thing. Hercules Fuerentes, most say, Rashmi. Yet all poetry as Morgan said, is deeply personal. I read it as a brave but luckless, celebrated but accursed father’s love for his daughte. Since the poem references Pericles and his daughter Marina in Shakespeare’s play Pericles, Prince of Tyre, the meaning of the poem should, depending, of course, in your preference for how to read poems, begin with the play which is complex in itself. Briefly, Pericles at the end of the play is reunited with his daughter who had died at childbirth and was buried a sea. Pericles travels the ancient world by boat distraught to point of forsaking even talking to anyone. At the end of the play the ruler of Mytilene sails to the boat, comes aboard, and seeing Pericles and hearing of his state suggest bringing to him an extraordinary woman, a maid, who may by her presence and speech save Pericles from his despair. Of course that woman is Marina, whom Pericles discovers in a very touching discovery scene is not dead but is reborn to him. The whole story is wrapped in the symbology of the sea, and water (Marina is her name), and a mystical notion of rebirth. In Elliot’s poem there is also the power of memory as a restorative agent. Elliot was deeply involved in mysticism, and this is yet another perspective from which to see his poem. Thanks for you thoughtful and detailed comment. Those for me are the most magical lines in “Marina.” I must have read “Burnt Norton” a hundred times over the years, but I never notice this connection. Thank you! My pleasure. I too have read Eliot, and especially the Four Quartets for decades. Thanks Kev. Eliot continues to be an inspiration to me, as I think is obvious in the post. Wonderfully evocative poem. Thank you. Though my favourite Ariel poem is not this one but Journey of the Magi. I’d like to make a small correction, if I may. You wrote that Eliot worked in a bank and joined the Catholic church. After working as a school teacher, he did work for Lloyds Bank, but he did not join the Roman Catholic church. He converted to Christianity and joined the Anglican church (although admittedly he sympathized with the High Church movement, a.k.a. Anglo-Catholicism, within the Anglican church). Thanks for the clarification, Simon. I met a gentleman in Tokyo, an Englishman, a couple years ago, who described himself as an Anglo-Catholic. I assumed that this was just a way of suggesting that he was a conservative Anglican. He gently insisted that he and other Anglo-Catholics regard themselves as Catholic rather than Protestant, just not under the rule of the pope. Since I’m nothing, this isn’t a matter of urgency for me, though. Picking up on the “Burnt Norton” and “Marina” image of “the leaves were full of children,” I thought to mention Eliot’s poem “New Hampshire” in the Landscape series (published originally as part of “Words for Music” in 1934–Burnt Norton was started in 1935). Helen Gardner suggests the children’s voices in New Hampshire as well as the rest of Landscapes contains a kernel of Burnt Norton and the Four Quartets. That’s great – I don’t know “Words for music,” but I will find it. Thanks! Eliot never joined the Roman Catholic Church. He was an Anglo-Catholic (High Church Anglican). Thanks for pointing that out. I realize I was quoting one of my lit professors from long ago who called him a Catholic. I will update the post accordingly. Reading this page is like looking into a mirror. I also took a “Yeats and Eliot” course. I attended the University of St. Thomas in Houston. And I have read and re-read Yeats and Eliot throughout my life. *And* Marina is also my favorite Eliot poem. Many thanks for your page here. Many thanks for visiting and letting me know of the parallel sensibilities!